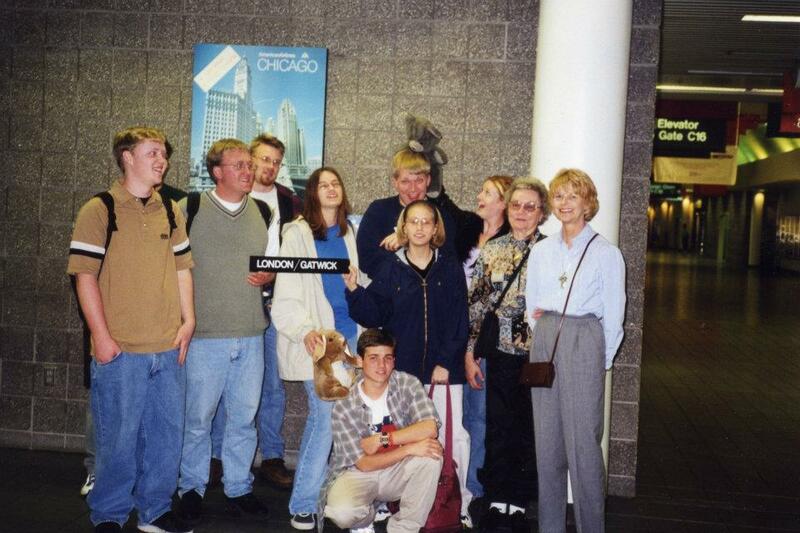 On our way to England in Spring 1999. Aydrian is kneeling in front. I’m behind him, with the stuffed rabbit. Mrs. Cutler is the redhead at the far right. Yet another of my good friends from high school has passed away. A year or two ago, my friend Sara died. She was one of the sweetest, most gentle people I’ve ever had the pleasure to know. Our mutual friend Aydrian died this weekend. He was such a bright light to everyone who knew him, and he will be sorely missed. I met Aydrian for the first time at a little street festival in my hometown when we were in junior high. He was from the next town over, and was dating my friend Kim. At first I was a little suspicious of this new guy, and jealous that Kim was dating someone. I remember that his voice was just changing, and he sounded scratchy and gruff one moment, high-pitched and embarrassed the next. When I got to high school the next year, I found out that Aydrian and I were in the same Air Force Jr. ROTC class. 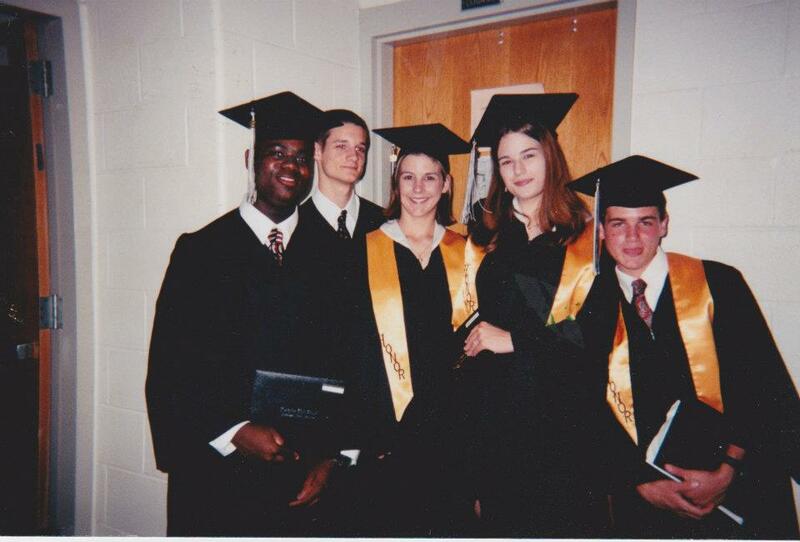 We’d both been enrolled in the class because our parents couldn’t afford college, and we planned to go into the Air Force to pay for continuing our educations after high school. One of our very first classes together, the entire class went outside to play kickball for PT, and Aydrian and I bonded over being not-at-all athletic. Another classmate, John Scott, spent most of the game getting pissed at Aydrian and I for dropping the ball and losing us points. Both of us were of the opinion that it’s easier to laugh off bad attitudes, and we spent the game making fun of John Scott. We were close from that point forward. As school went on, Aydrian became one of my best friends. We were both officers in JROTC, and also were both members of the military color guard and drill teams. We went away to competitions together, and were also taken on other special trips just for the best students of the class. Outside of JROTC, we were in many other classes together, and as overachievers, we were also in several of the same clubs. It only made sense to hang out outside of school, as well. 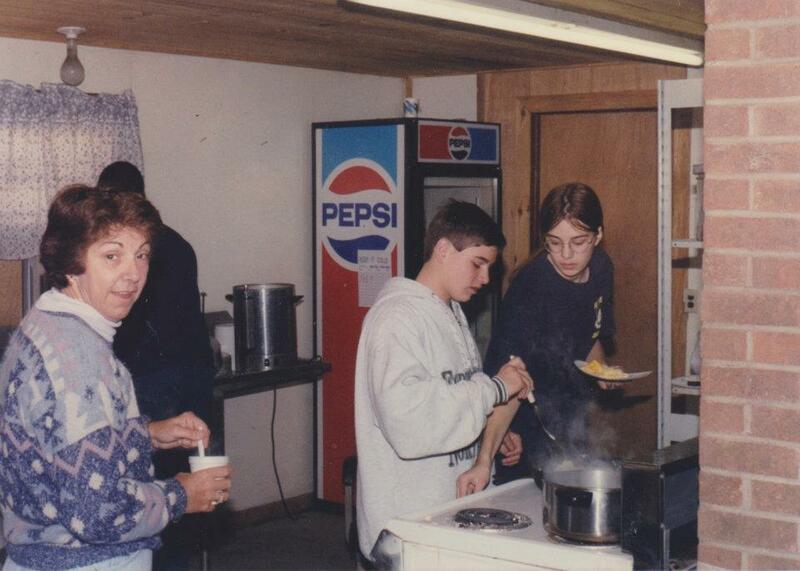 Our favorite teacher, Mrs. Cutler, would let us leave school during yearbook class our senior year to get cheeseburgers off-campus for lunch, as long as we’d bring her one back as well. For painfully good kids, we managed to have some fun pretending to be bad. Aydrian and I, scrounging up breakfast at an ROTC overnight “camping” trip. We stayed in tents, but definitely weren’t roughing it. He liked to pick, and he really knew how to get under your skin. He had two sisters, so he’d had a lot of practice by the time we met. He was generally very kind to me, but I remember getting into a fight with him once. I don’t remember what it was about, but I remember that we were in the hallway at school, and he got me highly irritated – then kept pushing my buttons until I completely lost it and started choking him. I had my hands on his throat, throttling him, and he started to laugh hysterically. All at once I wasn’t the least bit mad, and we both started laughing at the weirdness of the moment. It seems odd to tell the story now, because it makes me sound insane, but we both treasured that moment, and talked about it again a few times in later years. At first I didn’t realize that Aydrian was gay. Sexuality just wasn’t something I thought about in high school, and he was also dating a girl. But the other kids could sniff that kind of stuff out, and he got bullied a fair bit. He was a tough kid, and stuck up for himself well enough, but it must have hurt. He never once let it show. He kept that smile on, even when he must have been in such pain. Eventually I kind of figured out that he might not like girls, but it wasn’t something we talked about, and it definitely didn’t affect our friendship in any way. I loved him dearly. I couldn’t have cared less if he had horns and ate virgins for breakfast, as long as he shared that silly grin with me now and then. Not long after I went away for college, Aydrian got seriously into evangelical Christianity, and became very fervent in his hatred for gay people. He called me up at college often, and during our conversations he’d talk about how awful homosexuality was and how gay people should be punished. He was violent and angry, and this new side of him scared me. He wasn’t the same sweet boy that I’d loved in school. Eventually I snapped. I told him that I wouldn’t stand for someone threatening one of my best friends with violence and hatred. I said that if anyone else was talking about hurting HIM, I would do anything I could to stop them. And here he was, essentially sharing his hatred for himself. I told him I wouldn’t listen to it anymore, and not to call me until he’d found a way out of the hatred. We didn’t talk again for four or five years. At graduation, making a silly face (as always). I’m the one with long hair, and Aydrian’s directly to my left. He found a way out, though. And when he did, he did it brilliantly. He moved to Colorado and began to get involved with local government in the fight for LGBT rights. He was amazing, and courageous in the face of such darkness. He helped so many people, and was beloved by many. I am so, so proud of his work. Sadly, Aydrian and I never really repaired our friendship. We still talked now and then, and had begun to be a little closer again, but our friend Sara died and we drifted. He was very ill for a little while in Colorado, then moved home to be with his family and seemed to be doing better. Last week, while I was home in NC visiting my father, Aydrian was admitted to the same hospital that I was visiting. I didn’t know he was there, and missed my chance to say goodbye. He had an abscess on his brain, and though the doctors were able to patch him up for awhile, he started bleeding again this weekend and faded away. There was no pain, and I’m told that he was surrounded by his large, loving family at the end. I miss that happy boy. He had such a beautiful smile. Maybe he’ll see Sara, and Mrs. Cutler. Wouldn’t that be lovely?